This is what happens when you give the memorial company a blank check. 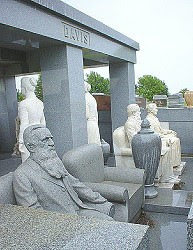 Davis was friends with a local tombstone salesman named Horace England, and together the two men designed a memorial consisting of life-size marble statues of John and Sarah as they looked on their 50th wedding anniversary. The statues would stand at the foot of the graves and face the headstones; the cemetery plot would also be protected from the elements by a 50-ton marble canopy supported by six massive columns. Completed in 1931, the Davis memorial was easily the most impressive in Hiawatha, probably in the entire state. And yet when Davis got a look at it he felt something was missing. The giant stone canopy dwarfed the pair of statues beneath it. The solution? More statues. I've been here. It probably gets so many visitors because there's nothing else *to* visit. That's awesome. Reminds me a little of this http://en.wikipedia.org/wiki/Springthorpe_Memorial from my hometown. Thanks, Rob!. The link got clipped, so here it is again. And here's a 2002 article on Springthorpe's Magnificent Obsession.